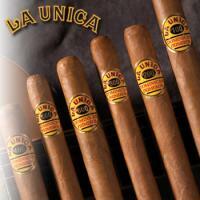 Born in 1986, made by the Fuente family, La Unica Cigars are an excellent value. Made from the best long-filler tobaccos, this consistent blend is well balanced which produces a mild flavor and aroma. For our serious cigar smokers, the popular La Unica 100 cigar contains premium tobaccos, which are well constructed with the finest Connecticut natural shade-grown broadleaf maduro wrappers. Find out why La Unica Cigars received a rating of 90 by Cigar Aficionado, which is "outstanding," and are the top bundled cigar to buy online in the USA.